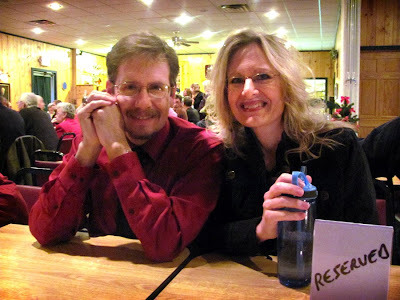 This past Sunday night found us at Freddies’ Restaurant in Mora, MN, about 20 minutes away from our home in Braham. 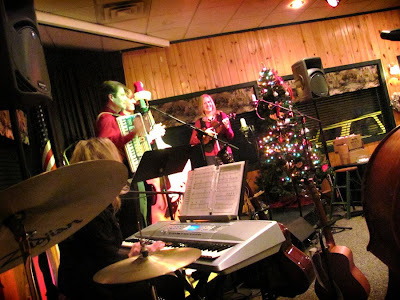 Originally, we were supposed to sing there for the Hillman Baptist Christmas Party on December 11th, but due to a large snowstorm which swept through the Midwest, the concert was rescheduled for January 9th, 2011. 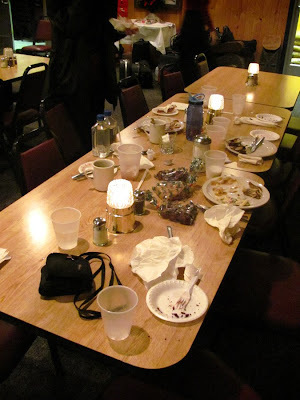 And yes, it was still a Christmas party! 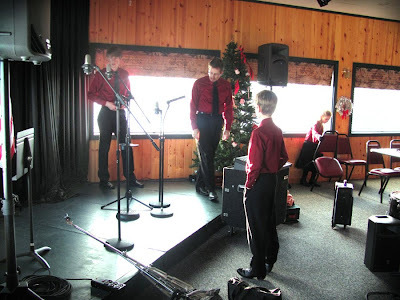 Setting up: we amazingly were able to fit our small sound system and ourselves upon the stage at Freddies. Mom and Leesha putting instrument stands together. 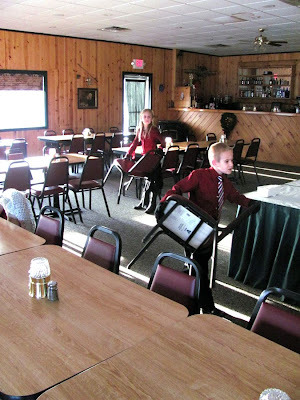 Caleb and Jayme moving chairs to make more room. Before the concert: Caleb grins while Sam chuckles about something. 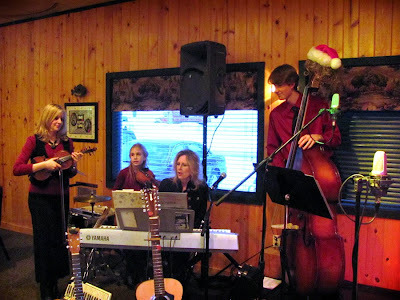 Mom, Ben, Jayme, and I doing prelude music. Dad and Mom smile sweetly for the camera. How do you like the lights? Some of us were green, others were yellow, a few were blue, and don’t forget the shades of red! 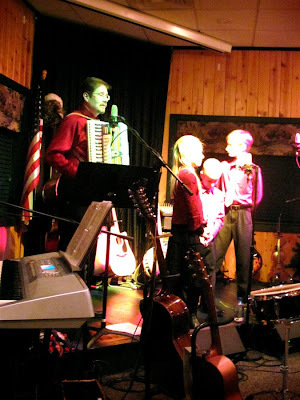 Dad introducing “Little Drummer Boy”. What a meal! Well, this is all that was left, anyway. The sweet people of Hillman Baptist graciously treated us by paying for our meal at Freddies. IT WAS AWESOME! We all the loved the potatos, coleslaw, fried chicken, and above all, RIBS! 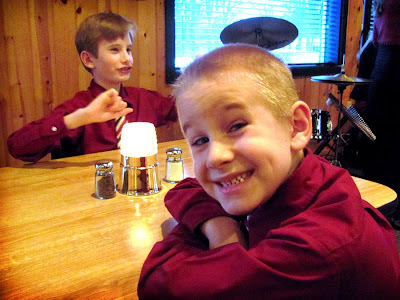 Freddies has better ribs than “Famous Daves”, in our opinion-just ask Caleb, a new ribs fan. We thoroughly enjoyed our time spent with the body of Christ last Sunday and came away very blessed by the kindness, warmth, and generosity of new friends. I’m getting caught up on reading several of your posts this evening, and I’m enjoying every minute of it. You are a beautiful family both inside and out. 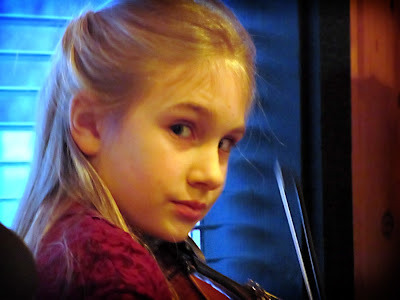 It is obvious that you love singing and brightening the lives of those you minister to. The Christmas picture of your family is lovely.